I have high blood pressure, but it is under control because I take a prescribed medication each morning and also at night. I researched this for my own purposes and thought it might be useful to others, so here it is. Risk of rupture, which can lead to a stroke or aneurysm. Vascular scaring, which can trap cholesterol, plaque or blood cells. Blood clots, which can lead to a heart attack, stroke, or organ and tissue damage. Plaque buildup, which can also lead to a heart attack, stroke, or organ and tissue damage. Furthermore, even before any of the above mentioned conditions have been diagnosed, you may have already developed heart, brain, eyes or kidney issues due to high blood pressure. Unfortunately, high blood pressure is becoming increasingly common in the United States. High blood pressure normally develops over years, and affects almost everybody eventually. While now about one third of adults over age 20 have high blood pressure, this number is expected to rise up to 41 percent by 2030. Furthermore, only one fifth of people with high blood pressure are actually aware of their condition. Only about half of people with high blood pressure have their condition under control, even if three quarters are on hypertensive treatments. To put this widespread problem into perspective, an average of 1,000 people died every day in 2010 due to high blood pressure related complications. 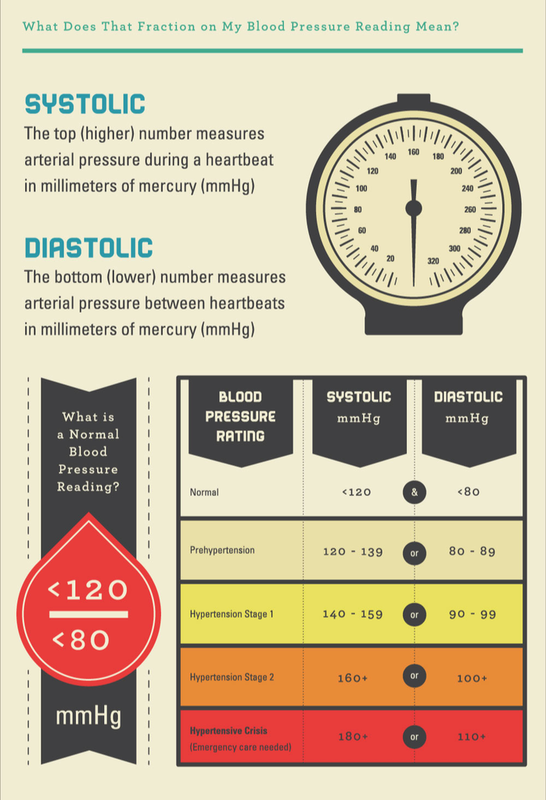 Blood pressure is measure in millimeters of mercury (mmHg) and recorded as two numbers, systolic and diastolic. Systolic is the top number (also the higher one), which measure the pressure in the arteries when the heart beats, so when its muscles contract. Diastolic the bottom number (also the lower one), which measures the pressure in the arteries between heart beats, so when the muscles relax and refill with blood. The blood pressure chart reflects the categories defined by the American Heart Association. A normal blood pressure is less than 120/80. If your blood pressure numbers are between 120/80 and 139/89, you have pre-hypertension, which means that you are likely to develop high blood pressure. If your blood pressure numbers are 140/90 or above, you have high blood pressure. For instance, if your systolic blood pressure is between 140 and 159, and your diastolic blood pressure is between 90 and 99, you have Stage 1 Hypertension. You have Stage 2 Hypertension if your systolic blood pressure is over 160 and you diastolic blood pressure is over 100. If your numbers are higher than that, you are in hypertensive crisis and need emergency care. Improve your diet: Eat more fresh produce, high-fiber foods, and lean protein. Reduce your sodium intake. Exercise regularly: Work out at least 30 minutes per day, fives times a week. Include muscle-strengthening exercise at least twice per week. Keep a healthy weight: If you are overweight or obese, consult with your doctor to see how you can reduce your weight in a healthy manner. Reduce Stress: High stress levels may have a negative impact on your overall health, including you blood pressure, so try avoiding very stressful situations and/or practice stress management techniques. Stop smoking: Smoke (both first- and secondhand) temporarily increases blood pressure and can contribute to cardiovascular diseases, among others. Take medications: If your blood pressure is at least 140/90 and you have been prescribed antihypertensive medication, take it as directed. Limit alcohol: For men, this means a maximum of two drinks per day, whereas women should not drink more than one drink per day. Be careful with heat: Very hot and humid environment, including hot tubs and saunas, can lead your blood pressure to rise. Take a blood pressure tests regularly: If you have normal blood pressure, the American Heart Association recommends having your blood pressure taken every two years. 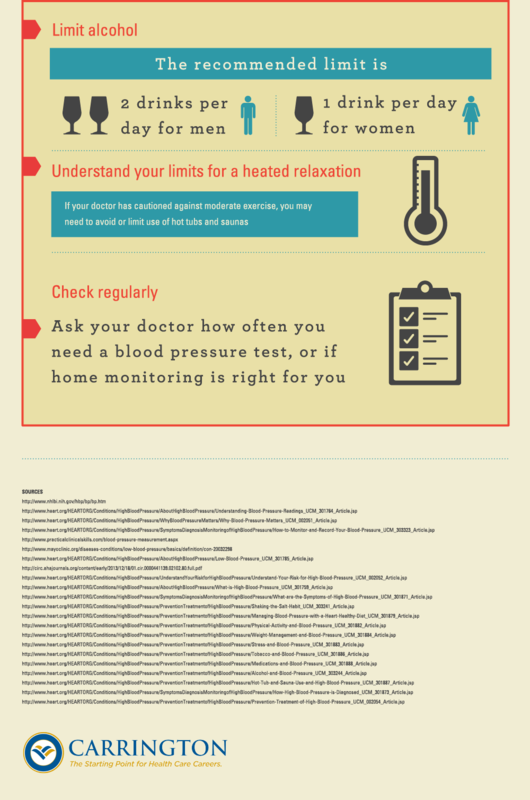 If your blood pressure is high, your doctor may want to take several readings and/or have you monitor it at home. This entry was posted in Fatherly Advice and tagged Advice, Health, hypertension. Bookmark the permalink.